Floods impact on both individuals and communities, and have social, economic, and environmental consequences. The consequences of floods, both negative and positive, vary greatly depending on the location and extent of flooding, and the vulnerability and value of the natural and constructed environments they affect. The consequences of floods, both negative and positive, vary greatly depending on their location, duration, depth and speed, as well as the vulnerability and value of the affected natural and constructed environments. Floods impact both individuals and communities, and have social, economic, and environmental consequences (Table 1). As most people are well aware, the immediate impacts of flooding include loss of human life, damage to property, destruction of crops, loss of livestock, and deterioration of health conditions owing to waterborne diseases. As communication links and infrastructure such as power plants, roads and bridges are damaged and disrupted, some economic activities may come to a standstill, people are forced to leave their homes and normal life is disrupted. Similarly, disruption to industry can lead to loss of livelihoods. Damage to infrastructure also causes long-term impacts, such as disruptions to supplies of clean water, wastewater treatment, electricity, transport, communication, education and health care. Loss of livelihoods, reduction in purchasing power and loss of land value in the floodplains can leave communities economically vulnerable. Floods can also traumatise victims and their families for long periods of time. The loss of loved ones has deep impacts, especially on children. Displacement from one's home, loss of property and disruption to business and social affairs can cause continuing stress. For some people the psychological impacts can be long lasting. In Australia, floods are the most expensive type of natural disaster with direct costs estimated over the period 1967-2005 averaging at $377 million per year (calculated in 2008 Australian dollars). 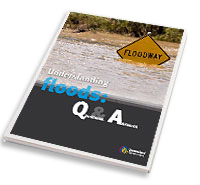 Until recently, the most costly year for floods in Australia was 1974, when floods affecting New South Wales, Victoria and Queensland resulted in a total cost of $2.9 billion. The Queensland Government estimates costs for the 2011 floods will exceed this figure for Queensland alone; with the damage to local government infrastructure estimated at $2 billion, and the total damage to public infrastructure across the state at between $5 and $6 billion. Flooding in key agricultural production areas can lead to widespread damage to crops and fencing and loss of livestock. Crop losses through rain damage, waterlogged soils, and delays in harvesting are further intensified by transport problems due to flooded roads and damaged infrastructure. The flow-on effects of reduced agricultural production can often impact well outside the production area as food prices increase due to shortages in supply. On the other hand, flood events can result in long-term benefits to agricultural production by recharging water resource storages, especially in drier, inland areas, and by rejuvenating soil fertility by silt deposition. Damage to public infrastructure affects a far greater proportion of the population than those whose homes or businesses are directly inundated by the flood. In particular, flood damage to roads, rail networks and key transport hubs, such as shipping ports, can have significant impacts on regional and national economies. Short-term downturns in regional tourism are often experienced after a flooding event. While the impact on tourism infrastructure and the time needed to return to full operating capacity may be minimal, images of flood affected areas often lead to cancellations in bookings and a significant reduction in tourist numbers. Flooding of urban areas can result in significant damage to private property, including homes and businesses. Losses occur due to damage to both the structure and contents of buildings. Insurance of the structure and its contents against flooding can reduce the impacts of floods on individuals or companies. In many natural systems, floods play an important role in maintaining key ecosystem functions and biodiversity. They link the river with the land surrounding it, recharge groundwater systems, fill wetlands, increase the connectivity between aquatic habitats, and move both sediment and nutrients around the landscape, and into the marine environment. For many species, floods trigger breeding events, migration, and dispersal. These natural systems are resilient to the effects of all but the largest floods. The environmental benefits of flooding can also help the economy through things such as increased fish production, recharge of groundwater resources, and maintenance of recreational environments. Areas that have been highly modified by human activity tend to suffer more deleterious effects from flooding. Floods tend to further degrade already degraded systems. Removal of vegetation in and around rivers, increased channel size, dams, levee bank and catchment clearing all work to degrade the hill-slopes, rivers and floodplains, and increase the erosion and transfer of both sediment and nutrients. While cycling of sediments and nutrients is essential to a healthy system, too much sediment and nutrient entering a waterway has negative impacts on downstream water quality. Other negative effects include loss of habitat, dispersal of weed species, the release of pollutants, lower fish production, loss of wetlands function, and loss of recreational areas. Many of our coastal resources, including fish and other forms of marine production, are dependent on the nutrients supplied from the land during floods. The negative effects of floodwaters on coastal marine environments are mainly due to the introduction of excess sediment and nutrients, and pollutants such as chemicals, heavy metals and debris. These can degrade aquatic habitats, lower water quality, reduce coastal production, and contaminate coastal food resources. Apan, A, Keogh, DU, King, D, Thomas, M, Mushtaq, S & Baddiley, P 2010, The 2008 floods in Queensland: a case study of vulnerability, resilience and adaptive capacity. Report for the National Climate Change Adaptation Research Facility, Gold Coast. Bureau of Infrastructure, Transport and Regional Economics 2008, About Australia's regions June 2008, Department of Infrastructure, Transport, Regional Development and Local Government, Australian Government, Canberra. Bureau of Transport Economics 2001, Economic costs of natural disasters in Australia, Report 103, Bureau of Transport Economics, Canberra. Douglas, MM, Bunn, SE & Davies, PM 2005, 'River and wetland food webs in Australia's wet-dry tropics: general principles and implications for management', Marine and Freshwater Research, vol. 56, no. 3, pp. 329-342. Prosser, IP, Rutherfurd, ID, Olley, JM, Young, WJ, Wallbrink, PJ & Moran, CJ 2001, ‘Large-scale patterns of erosion and sediment transport in rivers networks, with examples from Australia’, Freshwater and Marine Research, vol. 52, no. 1, pp. 81-99.